Southport, CT – The public is invited to Pequot Library’s Great Lawn on Friday, June 8, 2018, for the 13th annual potluck, outdoor concert, and campout to kick off its summer reading program. This favorite community event is now held in memory of Susan Ei, long-time Children’s Librarian at Pequot Library. 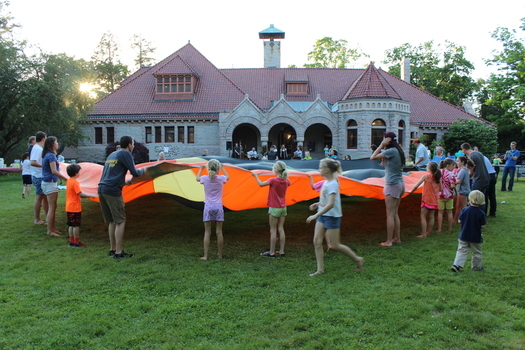 It is free, open to all, and takes place on Pequot Library's one-of-a-kind expansive front lawn. Throughout the evening attendees can sit and listen to the music or roast s'mores by a campfire, tell ghost stories, and enjoy fun lawn activities including badminton and playing with a huge spinnaker from a sailboat. Potluck supper begins at 6:30 p.m. At 7:15 p.m. the outdoor concert begins with the Merwin Mountain Band, a group formed by four neighbors in Fairfield, CT. The band came together because they were drawn to the music they all grew up with: Motown, country, rock 'n' roll, pop standards, and jazz. With two guitars, three-part harmonies, and the occasional bongos, the Merwin Mountain Band offers brilliant interpretations of a diverse song list. To sign up for the potluck, please visit pequotlibrary.org. For more information contact childrens@pequotlibrary.org or (203) 259-0346 ext. 116. Families are invited to stay until 9:00 p.m. for the Big Pillow Fight, or pitch their tents and camp out all night on the Great Lawn. The public is welcome to come for any part of the evening. Garden Catering is the event sponsor.